Ireland boss Martin O'Neill pictured during last night's match. 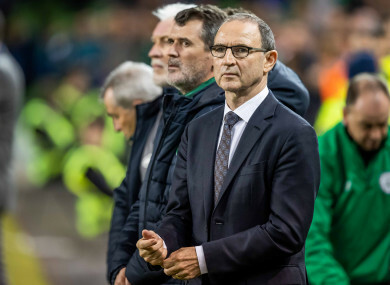 FOR ALL THE great memories he helped create in the first three years of his tenure, it now feels as if Martin O’Neill is running out of excuses. Given how dreadful they have been, it is simply impossible to put a positive spin on the last 12 months for the international team. More than a year has passed since Ireland last won a competitive fixture — a scrappy 1-0 victory over Wales in which the team scored with their only real chance of the game. In addition to a paltry five goals in 10 matches, of the side’s last 19 games, O’Neill’s men have prevailed in just four. Two of those were friendlies against USA and Uruguay. One was the aforementioned Welsh match. And the other was a victory over minnows Moldova in a World Cup qualifier. It is a measure of how grave the situation has become that the Moldovan success now seems like a high-water mark of attacking football by comparison to the perennial drudgery that has followed. The US victory was aided by the fact that the visitors arrived in Dublin with a squad that consisted mostly of inexperienced youngsters — a considerable number of their established names were left at home. The Uruguay and Moldova wins were helped by the presence in the team of the now-retired Wes Hoolahan, with the Dubliner influential and key to goals on both occasions. It is true that Hoolahan’s abilities were exaggerated at times by the media and fans, but he really did give the team a degree of creativity that they are now patently lacking — big goals against Italy, Austria and Sweden were either scored or assisted by the ex-Shels star, and his presence meant that even in games against world-class sides such as Germany, Ireland’s attack play had a degree of variety, so that Shane Long getting on the end of a Darren Randolph long ball was not the team’s only conceivable way of scoring. It says much about the flaws of the Irish system, however, which we’ve explored more deeply here and here, that the loss of a 36-year-old Championship player is so keenly felt. And while this change for the worse partially explains the distinct lack of creativity in the team, it should not excuse it. Paul Scholes recently suggested that even Lionel Messi would struggle in the current Manchester United system, and it feels as if a similar criticism could be aimed at the Irish set-up. Take the midfield, for example. It almost seems as if the personnel used is irrelevant. Alan Browne, Cyrus Christie, Conor Hourihane, Jeff Hendrick, Harry Arter, Robbie Brady, David Meyler and Callum O’Dowda have been among the players tried out in recent months, but the results are invariably the same. The one player who managed to transcend this problem to a degree was Declan Rice, but while the West Ham youngster impressed to an extent, he was far from imperious. Ireland still were comprehensively beaten by France with him in the side, and his best performance came against USA reserves. The Boys in Green’s players looked ill-at-ease at times in the 3-5-2 formation last night, but O’Neill afterwards refused to give up on the system, pointing out that it has made the team more defensively solid. Certainly, he has a point in this regard, as on the last two competitive occasions that his side played with a four-man defence, they were beaten 5-1 and 4-1 by Denmark and Wales respectively, even if the former fixture’s outcome was heavily influenced by some rather cavalier half-time substitutions by the veteran manager. And regardless of what system is deployed, Ireland constantly look toothless in attack. Again, it does not seem to matter whether it is Callum Robinson, Aiden O’Brien, Shane Long, Sean Maguire, Scott Hogan, Daryl Murphy or Jon Walters up front. The striker in question always seems to work doggedly, hold the ball up reasonably and feed off scraps. But you get the sense that even Robbie Keane in his prime would struggle to make much of an impact in this Irish side, given that the forwards under O’Neill tend to spend most of the game chasing opposition defenders in vain and haplessly trying to control hopeful long balls while positioned in and around the halfway line. O’Neill might argue that last night was only a friendly, and that he should be judged mainly on qualifiers for the Euros. The problem is that with Ireland of late, the nature of the match is irrelevant as the performance is always identical, no matter the quality (or lack thereof) of the opponents. The team consistently looks disorganised. There are no real patterns of play. And the only realistic hope of scoring is either via a set piece or an opponent’s catastrophic defensive error, such as Shaun Williams’ goal against Wales, where he robbed an overly confident Aaron Ramsey of possession in Cardiff when the hosts were already 4-0 up and operating in cruise control. While the Northern Ireland match at the Aviva was nowhere near as grim as the Welsh fixture from a defensive viewpoint, it is up there with the Republic’s worst attacking performances at home in the modern era. The Irish boss has promised recently that the return of key players in Robbie Brady and Seamus Coleman would improve the situation, but their influence was minimal on Thursday evening. O’Neill last month insisted he was confident Ireland could qualify for the Euros and urged people to keep faith, yet the evidence suggests the side are getting worse rather than better in many respects. The overriding fear is that, despite these claims to the contrary, the team’s pervasive staleness is irreparable under the current management. Michael O’Neill was correct last night when he said the North controlled the game. His namesake, meanwhile, has often lamented the fact that the Republic’s stars mainly play at a lower level compared to other international teams, but while the hosts’ starting XI last night featured four Premier League performers in addition to another coming off the bench, their opponents included just three footballers from the English top flight. Yet the visitors still managed to look the far superior side, dominating possession and creating the game’s only clear-cut chances, though a combination of wasteful finishing and Darren Randolph’s assured goalkeeping ensured the stalemate that many critics had predicted beforehand came to fruition. Avoiding being outclassed by their neighbours, who possess inferior resources and a far smaller population, is surely not too much to ask of this Irish team. Nevertheless, aside from Darren Randolph’s performance and the clean sheet it earned, it is hard to think of many other positives for O’Neill and co.
Perhaps the one crumb of comfort is the sense that it cannot get much worse from an attacking perspective and the only way is up from this point. O’Neill established his reputation as a top manager owing to his famed motivational skills and a perceived ability to get the very best out of limited players. At the moment, the opposite appears to be the case — Ireland look desperately lifeless and are underachieving significantly. Email “Martin O'Neill is running out of excuses”. Feedback on “Martin O'Neill is running out of excuses”.